The Central Neighborhood is the "heart" of Tacoma and, as the name suggests, is located at the city's center. It is bordered by major highways I-5, I-705, and SR-16, and sits just south of Commencement Bay and the Port of Tacoma. Homes for sale here are a mix of old and new, mostly single family and multi-family units. Though it is a largely urban area, Central Tacoma is home to Allenmore Public Golf Course and several parks, including Franklin Park, Delong Park, Snake Lake Park, and the Tacoma Nature Center. 3 Beds | 1.5 Baths | 2028 sq. Ft.
3 Beds | 2 Baths | 1270 sq. Ft.
1 Beds | 1 Baths | 714 sq. Ft.
3 Beds | 1.5 Baths | 1008 sq. Ft.
2 Beds | 1 Baths | 1208 sq. Ft.
4 Beds | 2.5 Baths | 2551 sq. Ft.
Blue Summit Realty has the most accurate and up to date Central Tacoma real estate listings on the web. Currently there are 6 homes for sale, 2 condos for sale, and 3 vacant land properties in Central Tacoma. Of the 11 total Central Tacoma residential listings for sale 0 are bank owned, 0 are short sales, 0 are new construction, and 0 are townhomes. The price ranges from $155,000 to $0 with a median list price of $328,533 and median sold price of $286,580. Make sure to refine your Central Tacoma real estate search by property type, price, square footage, bedrooms, bathrooms and more with the search tool above or view the Central Tacoma listings on our interactive map. 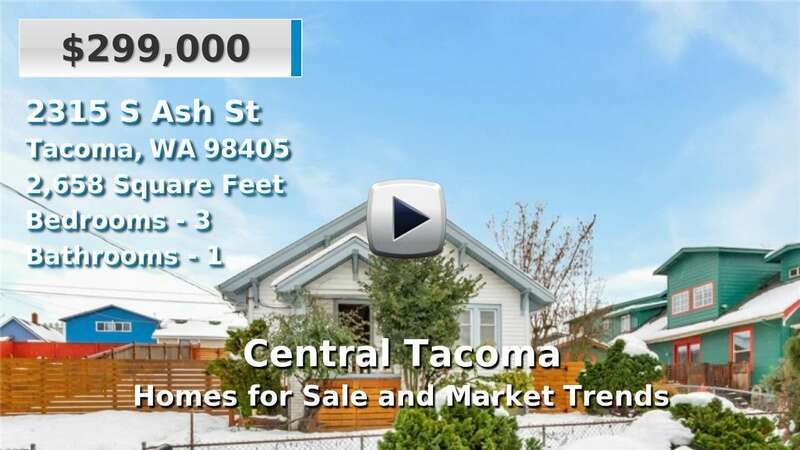 Our Central Tacoma real estate listings were updated 26 minutes ago.